The Royal Canadian Mounted Police (RCMP) have charged Senator Patrick Brazeau and ex-Senator Mac Harb with fraud, saying they claimed improper living and travel expenses. Mr Brazeau, who was already suspended from the senate, and Mr Harb, who resigned in August, were also charged with breach of trust. They, along with two other senators, were the focus of outside audits of their expenses last year. The two men deny the charges. Authorities say the senators claimed reimbursement for travel and housing expenses for secondary residences near the national capital, Ottawa, even as they in fact lived there full-time. 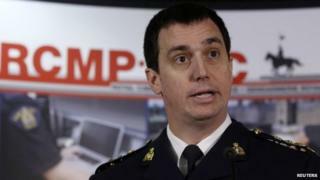 "Canadians expect the RCMP to be exhaustive and unbiased in our investigations," Gilles Michaud, the RCMP's assistant commissioner, said in a statement on Tuesday. "These investigations were detailed and involved careful consideration and examination of evidence." Mr Harb, a Liberal Party senator from Ontario and former MP, left the Senate in August 2013, dropping his challenge against an order that he repay 231,000 Canadian dollars ($220,000; £141,000) for improperly claimed expenses. The remaining three, Mr Brazeau, Mike Duffy, and Pamela Wallin, all Conservatives, have been ordered to pay back thousands in expenses and were suspended from the chamber by a vote in November. Mr Harb and Mr Brazeau, who represents the Repentigny, Quebec, division, were the only two charged on Tuesday. It is unclear if RCMP officials will bring charges against Mr Duffy, representing Cavendish, Prince Edward Island, or Ms Wallin, representing Saskatchewan, in the future, but Mr Michaud said the RCMP was continuing its investigation. Mr Harb's lawyer, Sean May, told broadcaster CBC it was "disappointing that charges are being laid. He's going to be prepared to respond in court and he looks forward to that." Mr Brazeau has previously said he will fight any charges. Canadian senators are appointed by the governor general of Canada - the Queen's representative - on the advice of the prime minister. They typically join either the government caucus or the opposition caucus, or sit as independents.